SEATTLE – While his teammates – all of them likely unaware of his decision – conversed/yelled in the Mariners’ clubhouse before Tuesday’s game at loud decibels to overcome the blaring music already playing, Hisashi Iwakuma stood quietly at his locker with his translator Antony Suzuki ready to discuss the end of his time with the Seattle Mariners and Major League Baseball. After another season of starts, stops and setbacks in trying to return from offseason shoulder surgery, time ran out on Iwakuma and his chances to help the Mariners in 2018. And he knows that his best chance to pitch again in 2019 won’t be in a Mariners uniform. The Mariners brought back Iwakuma on a minor league contract this season, hoping he could recover from the surgery and help out the pitching staff in the second half of the season. Despite Iwakuma’s tireless work ethic and hours upon hours of diligent strengthening, throwing and rehab, he never could make it happen. He got close multiple times, but experienced setbacks when throwing in live batting practice sessions. He made his way back to pitch in two rehab starts – a total of three innings – for short-season Everett. But it wasn’t viable for a return to the big leagues. In seven seasons with the Mariners, Iwakuma made 136 starts and 14 relief appearances, posting a 63-39 record with a 3.42 ERA. He struck out 714 batters and walked 184 in 883 2/3 innings pitched. He also tossed the organization’s fifth no-hitter in 2015. After agreeing to a three-year free agent contract with the Dodgers before the 2016 season, Iwakuma failed his physical. When the Dodgers tried to restructure the deal, Iwakuma opted for a one-year incentive-laden contract to return to the Mariners. He’s never pitched for any other MLB team in his career. It’s something that he takes pride in. After a standout career with the Rakuten Golden Eagles in NPB, Iwakuma’s player rights were awarded to Oakland in the previous posting system after the 2010 season. However, Iwakuma and his agent couldn’t reach an agreement with the A’s in the 30 day window. He returned to Rakuten for the 2011 season, missing a good portion of the season with shoulder issues. Iwakuma signed with the Mariners after the 2011 season for just a $1.5 million with a heavily incentive-laden contract. After pitching in relief to adjust to MLB’s pitching schedule and giving his shoulder time to recover, he put together a solid season, posting a 9-5 record with a 3.16 ERA in 14 relief appearances and 16 starts. The Mariners signed him to a contract extension. He had a marvelous 2013 season, posting a 14-6 record with a 2.33 ERA while being selected to the American League All-Star honors and finishing third in Cy Young voting. As he progressed into his mid-30s, Iwakuma dealt with injury issues each season, but proved to be effective when healthy. But after posting a 16-12 record with a 4.12 ERA in 33 starts in 2016, he developed shoulder issues the following season. 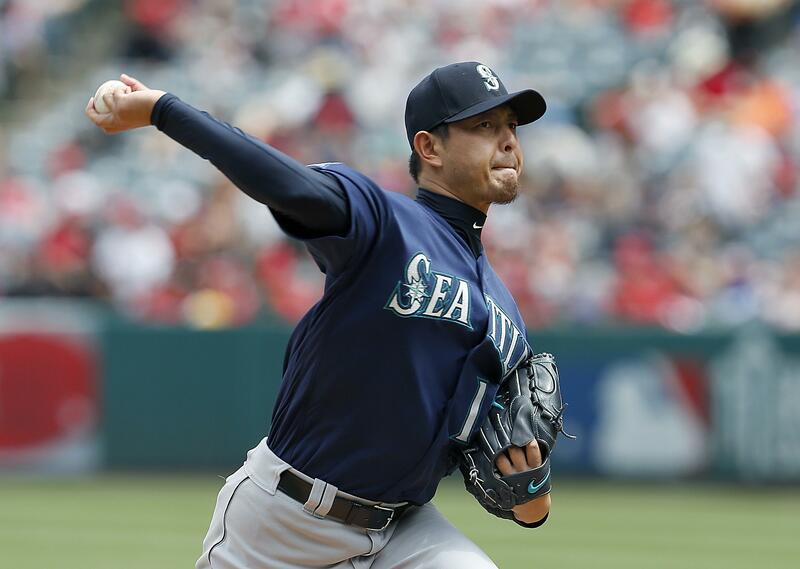 Iwakuma pitched in just six games before going on the disabled list on May 10. He tried multiple comebacks, but never pitched in another MLB game that season. He eventually had surgery to clean up the shoulder in September. Looking back, Iwakuma admitted he’d exceeded his and most people’s expectations when he first arrived in the U.S. Published: Sept. 11, 2018, 5:57 p.m.